The plans are unchanged from those submitted in November 2017. These were rejected by the South Planning Committee in October 2018. The full reasons for the rejection are below. 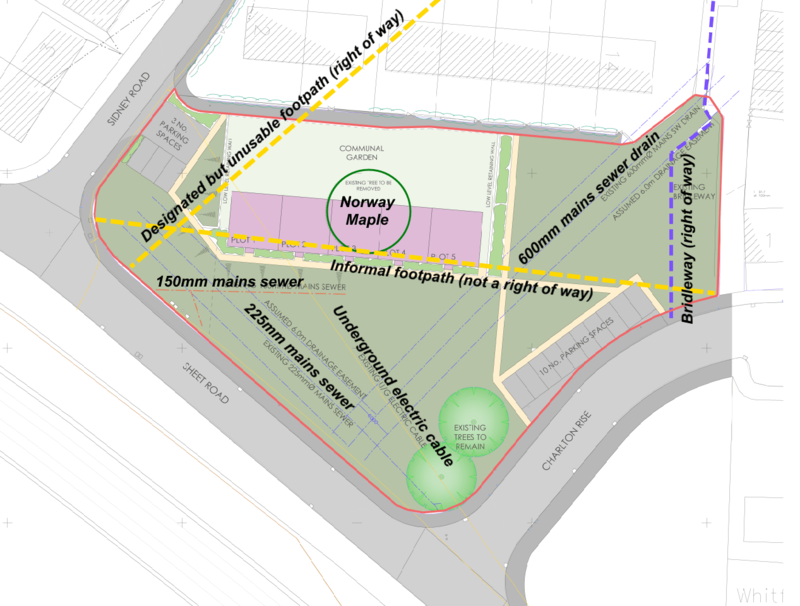 In summary, the committee said the loss of the Norway Maple and reduction in green space “would remove features that make significant contributions to the character and quality of the townscape and local amenity.” The footpath layout is too close to front doors. Parking and bin storage is inappropriate. The design is poor – new planning rules introduced last summer put a greater emphasis on good design, both of buildings and neighbourhoods. This scheme fails on both counts. Connexus, which did not turn up to the South Planning Committee meeting, has now launched an appeal. There are three ways of progressing an appeal. A public inquiry, which is expensive and usually requires barristers. A hearing, which is an informal discussion between parties. And written representations, where the appeal is conducted by an exchange of letters, usually emails. Connexus has decided to go for written representations, the lowest cost option. It will involve a site visit by the inspector. This might be private, or with Connexus and Shropshire Council representatives. Shropshire Council will be opposing the appeal. Paperwork for the appeal will be on Shropshire’s planning portal (19/02702/REF). The planning inspectorate’s website for the appeal is at APP/L3245/W/19/3220169. All comments residents have already made have been copied to the planning inspectorate. But I would advise people to submit additional objections or comments of support. The deadline is 14 March. There are three ways to send comments – the third is the best. You can send three copies on paper to Ruth Howell, 3D Eagle, Temple Quay House, 2 The Square, Bristol BS1 6PN. You can email your comments to north2@pins.gsi.gov.uk. You must cite the reference APP/L3245/W/19/3220169. Perhaps easiest of all, you can comment online using this link. People objecting to this scheme do not have to use planning jargon. You do not need to have read the National Planning Policy Framework, core strategy or SAMDev. The inspector will be looking for evidence of amenity. Evidence that this is a much-loved community green and it is important to your lives. Below, I repeat the statements Tracey Huffer and I made to the South Planning Committee, along with the committee’s formal grounds for refusal. I am appalled that this application has been resurrected with a recommendation for approval after being quiet for a year. A year ago, I exchanged emails with a planning officer who said the scheme was poor quality and he would recommend refusal. That officer has since left Shropshire Council. I am shocked that we now have this application coming flagged up for approval. How can this council say one moment a scheme is not good enough to approve but a year later say that it is just fine? That doesn’t make any sense to me. This scheme is barely different from the application this committee previously refused. It doesn’t deal with any of the issues that were raised at that committee meeting. The loss of green space was huge under the previous application. Now they have moved the fences forward, even more green space is lost. The pedestrian access to Sidney Road is badly thought out. Elderly, vulnerable people will go to catch the 701 town bus service to find their sightlines blocked by bins. This could be lethal. We have already lost one tree on this green. The three main trees, now two, were paid for by the residents of Sidney Road. They are still part of why they enjoy where they live. Sheet Road is one of the main access routes into Ludlow. This scheme will make this approach less attractive. This is also a community green. I know people who walk across it four times a day. I’ve seen young children play with their grandparents on the green a lot of times. I am very worried about the drainage and sewerage across the site. The council has not published any comment from Severn Trent. The site has flooded in recent years and the Stych Brook runs under it. I think this is one reason why the green wasn’t built on in the first place. This housing scheme is pretty much thrown together and should be refused. I don’t want to sound negative. All of us councillors in Ludlow want more affordable and social housing. We have identified brownfield sites where we could build affordable housing. We have taken council leaders on a tour of the most promising areas in the last couple of weeks. We support affordable housing, social housing and bungalows. But we need to build them in the right place. We should not sacrifice valued green space on a major gateway into Ludlow when we don’t need to. I was not present at the consideration of the previous application. However, this is a fresh application. It is not an application that has been deferred for amendment. It was refused. This is therefore a new application that must be considered on its own merits. National planning policy has also changed since the initial refusal decision was made. This is an old application and as far as I can tell an old committee report. It makes no reference to the new National Planning Policy Framework at all. I wish to focus on two points. The loss of green space and a much loved tree. And the quality of design. Beginning with design first. This is not a quality design. It is very poor compared to recent social housing schemes we Ludlow councillors have enthusiastically supported at Beech Grove, the Riddings and the Foyer. No effort has been given to designing a development worthy of a major gateway into Ludlow. At paragraph 130, the new NPPF calls for poorly designed schemes to be rejected. Too often we have seen poorly designed schemes approved in Shropshire, despite the support for good design in CS6. The wording of the new NPPF was drafted to draw a line under that across the entire country. We should follow its lead and outlaw poor design in Shropshire. This scheme should be rejected on those grounds alone. The NPPF also emphasises that brownfield should be developed before green sites. We are not short of brownfield sites in Ludlow. There are more than six hectares in the council’s brownfield register. Some sites are available now. Some are likely to become available shortly. Tracey Huffer and I have recently taken cabinet members and senior officers on a tour of additional brownfield sites amounting to around one and half hectares. (Viv Parry was on leave.) We have also identified additional brownfield sites and are working towards getting those available. We are not short of brownfield land for housing, or for that matter business, in Ludlow. Even in a town surrounded by green hills and forests like Ludlow, urban green space is precious. The council’s policy to protect local amenity is stated with clarity at MD2 in SAMDev. MD2.2 states that development should “Contribute to and respect locally distinctive or valued character and existing amenity value.” This proposed development will destroy amenity value. This plan will remove 42% of the usable green area from this much enjoyed green. It will reduce connectivity and make this green space less useable. We have already lost one of the Norway Maples on the green. This was cut down without warning “due to the high costs of maintenance”. You saw the Norweay maple destined to be felled under this scheme today. It is a fine healthy specimen and as Tracey has said, it was planted by residents shortly after Sidney Road was built. Affordable housing is always a benefit in Ludlow. We are fortunate that 64 affordable homes are at the final stages of planning permission on Foldgate Lane and at Rocks Green. But affordable homes must not be built to the detriment of the quality of our townscape and the amenity of residents. We need to approve schemes that meet the objectives of the new NPPF. Creating high quality buildings and places. We need to preserve green space and amenity. This scheme conflicts with NPPF 124 and 127. Indeed NPPF 130 calls for poorly designed schemes to be rejected. It conflicts with CS6, MD2.2 and MD 2.5. I urge the committee to reject this proposal. 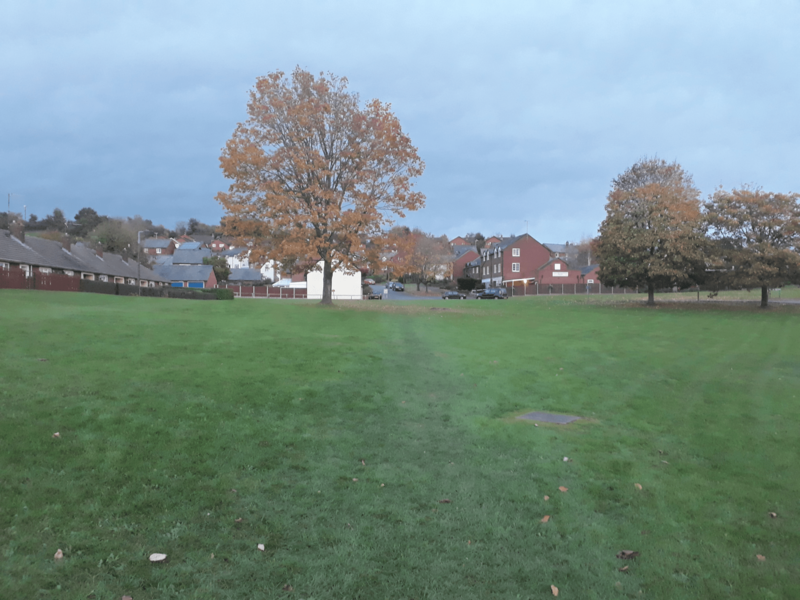 It is acknowledged that the proposed development would be in a sustainable location, contributing to the social and economic roles of sustainable development through the provision of small affordable bungalows, which is a type of accommodation for which there is an acknowledged need in Ludlow. However, the proposal, by reasons of the loss of the large Maple tree, which is the subject of a Tree Preservation Order, and reduction in the area of open space, would remove features that make significant contributions to the character and quality of the townscape and local amenity. The proposed footpath layout within the development, with the path linking Charlton Rise with Sidney Road passing very close to the front doors of the bungalows, is likely to be used by the public and would adversely affect the amenity and perception of security for the occupants of the bungalows. Furthermore the location of the proposed parking and refuse collection points are considered inappropriate for the type of accommodation proposed. In addition, the external design, layout and appearance of the proposed bungalows would fail to improve the character and quality of the area. Consequently, the proposed development would be contrary to paragraphs 124, 127 and 130 of the National Planning Policy Framework, would not satisfy the environmental role of sustainable development as set out in the NPPF and would be contrary to Core Strategy Policies CS6, CS8 and CS17, and SAMDev Plan Policies MD2 and MD12. Reminded of the song “Another one bites the dust” – the existing bungalows in Sidney in terms of access and parking were abysmally thought out, now they want more of the same? They chopped down a tree already and also put a “No games” sign on the green – reminds one of a ploice state really…some faceless nameless clerk deciding the way things should go on a green they will never visit.